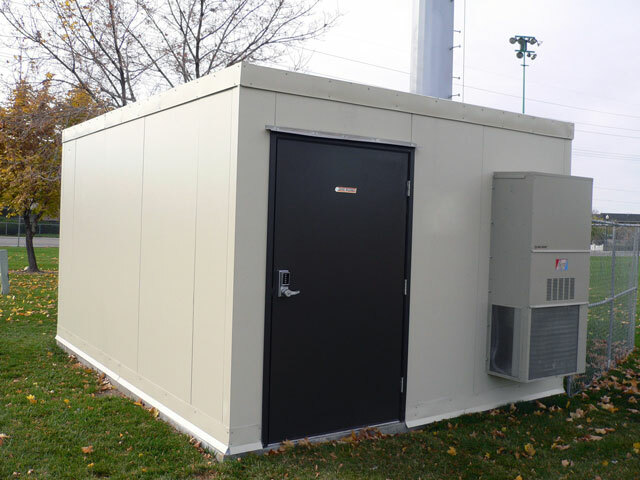 Enviro Buildings are constructed with 4” high density foam insulation to provide the best insulation and durability. Because of the insulation’s high R-value, the Industrial Buildings can be designed to maintain temperatures from -20 degrees to 120 degrees Fahrenheit. Outdoor buildings are completely weather and pest proof. The weather membrane installed on the roof is guaranteed to prevent any leaking and the insulation is a natural pest deterrent. To prevent air infiltration, Outdoor Buildings are fit together using a tongue and groove routing system and then locked side by side with cam locks. To protect the seal even further, gaskets are placed along all edges of the panels. When the cams lock tight, the gaskets provide an air tight seal which is optimal for temperature and dust infiltration control. Call 800.728.5454 for more information or to request an outdoor building quote fill out our quick quote form below.